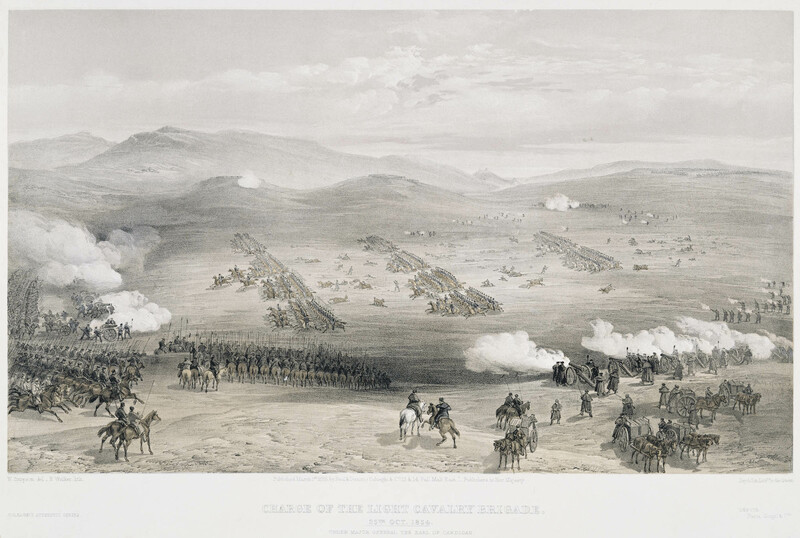 A lithograph depicting the charge of the Light Cavalry Brigade on 25 October 1854. Letter with title and artist and publication details. From Simpson's Seat of War in the East, First Series. 1855/1856. The Battle of Balaklava took place on 25 October 1854, when the Russians attempted to take the harbour from the British. At the battle a confusion of orders resulted in the Light Cavalry Brigade charging the wrong enemy position. In this print they can be seen advancing along the North Valley surrounded on three sides by the Russians. When they reached the enemy guns at the end of the valley, those who had survived had to turn around and ride back through the enemy fire. 107 men and 397 horses were killed in the action.